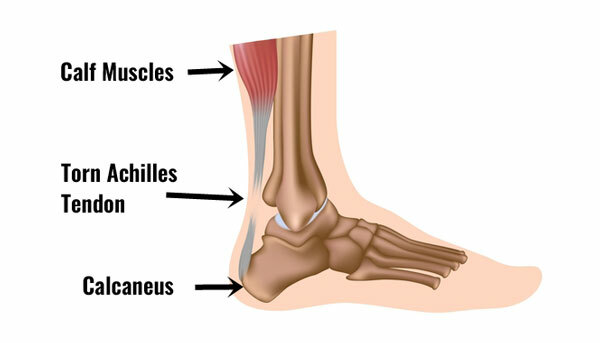 A total rupture of the Achilles tendon is a complete tear of the tendon and typically affects men over the age of 40 involved in a recreational sport. A sharp pain, as if you have been hit, in the Achilles tendon is the main indicator of a rupture. Sometimes you can even hear it snap. Read more on how to assess if you have an Achilles rupture, and ways to treat it if you have got this injury. It is not always recognized at the time of injury, however, it is very important it is treated properly as soon as possible to increase the chances of a good recovery. Symptoms include a sudden sharp pain in the Achilles tendon which is often described as if being physically struck by an object or implement. A loud snapping noise or bang may also be heard at the time. A gap of 4 to 5 cm in the tendon can be felt immediately after injury which may be less obvious later as swelling increases. There will be considerable loss of function and the patient will most likely be limping, however, they may still be quite capable of walking or even playing on due to other muscles compensating. 1. With the patient lying face down with their feet hanging over the edge of a table or therapy couch, the foot of the injured side will hang directly down, compared to the non injured one would be slightly pointed (plantar flexed). 2. Is there a gap of approximately 3 to 6 cm in the Achilles tendon directly after injury? If there is too much swelling then this is not always obvious. 3. Plantar flexion strength is significantly reduced. For example, the patient will be unable to point their foot downwards against resistance or go up on top toes. 4. Thompson’s squeeze test will give a positive result. Thompson’s test is performed by squeezing the calf muscles at the belly of the muscle. In a healthy ankle, the foot should move. 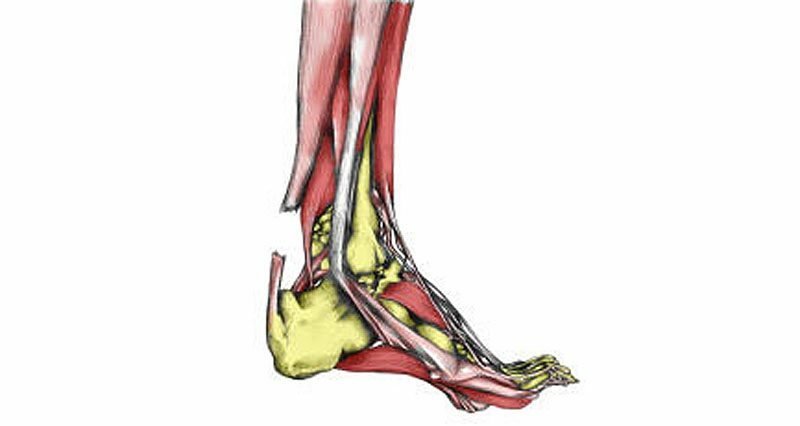 If there has been a complete rupture of the Achilles tendon then the foot will not move as expected. Sometimes it can be difficult to tell if there has been a complete rupture of the Achilles tendon just by looking or level of pain. The Achilles tendon runs from the calf muscles at the back of the lower leg and inserts at the back of the heel or calcaneus bone. Large forces are transmitted through the tendon when running and jumping. The tendon itself is surrounded by a thin sheath. A torn Achilles can be a partial rupture or a total rupture. A total rupture is more common in men affecting them 10 times more than women. The injury typically occurs 30 to 40 minutes into a period of exercise rather than at the start of a session and nearly always happens from a sudden explosive movement or bending the foot upwards (known as dorsiflexing). Many patients are able to continue to function following an Achilles rupture due to other muscles compensating, although the injured leg will be significantly weaker. If a total rupture of the Achilles tendon is suspected then apply cold therapy and compression and seek medical attention as soon as possible. When the Achilles tendon suffers a complete rupture there are two choices for treatment; surgical or nonsurgical. The conservative route, which involves initial immobilization to allow the tendon to heal, followed by strengthening and improving flexibility. 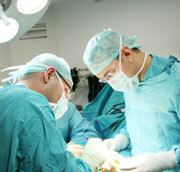 In most cases, surgery is required and the sooner this takes place the higher the chances of success. If the injury is left longer than two days then the chances of a successful outcome may decrease. Sometimes the leg is put in a cast and allowed to heal without surgery. A full rehabilitation program is necessary following surgery with the patient being out of competition for between 6 and 12 months. A complete rupture of the Achilles tendon is a serious injury and rehabilitation should be a very gradual process taking 6 to 9 months. The following guidelines are for information purposes only. We recommend seeking professional advice before attempting any self-treatment. There are three stages to rehabilitating a total rupture of the Achilles tendon. The speed at which a patient can progress with the rehabilitation exercises will vary and should at all times be done under the supervision of a qualified professional. The timescales indicated below are only a rough guide and you should always take the advice of your consultant. This will follow a similar pattern to that of the surgical approach although will take a lot longer. A plaster cast will be applied in a plantarflexed position (toes and foot pointing down). Sometimes after four weeks, this may be altered to allow less plantar flexion. After 8 weeks the tendon has usually healed. Sports massage techniques (play video) and ultrasound can aid in this process by helping to realign the new fibres in line with the tendon. This is increased to 12 months if the Achilles was immobilized in plaster instead of operated on. There is also a greater risk of re-injury if the athlete does not have the surgery. What does Achilles tendon surgery involve? Reconstructive surgery for a ruptured Achilles tendon is a popular option especially with younger, more active patients although more recently non-operative treatment is being considered for all patients. Open Surgery: Here the surgeon makes a single large incision down the back of the calf allowing access for the tendon to be reattached. This method is associated with a 27% lower risk of repeated rupture, although an 11% risk of complications such as infection and adhesions. Percutaneous Surgery: Involves several small incisions through which the Surgeon reattaches the tendon. This technique has demonstrated higher re-rupture rates and a higher occurrence of nerve damage, although has a lower chance of resulting in infection. After Achilles Tendon Surgery The post-operative period varies between surgeons. A period of immobilization of 6-12 weeks has previously been favored. Usually, a cast or walking boot is provided to support the ankle and prevent movement. The cast is initially set to keep the ankle in a position of plantarflexion (the shortest position for the Achilles tendon), allowing the tendon to heal. The cast is then gradually adjusted to bring the foot into a neutral position and lengthen the tendon. However many Surgeons are now beginning mobilization a lot earlier (1-2 weeks) in order to prevent the tendon from becoming stiff and weak. Movement helps to decrease swelling and orientation of the new tendon fibres being laid down, resulting in higher tensile strength. Exercises begin with simply circling the ankle joint, increasing the size of the circles. Stretches are then introduced, followed by strengthening with resistance bands before weight-bearing exercises are commenced. To give the patient confidence and reduce the strain on the Achilles tendon as rehabilitation progresses a simple Achilles taping technique can be used.